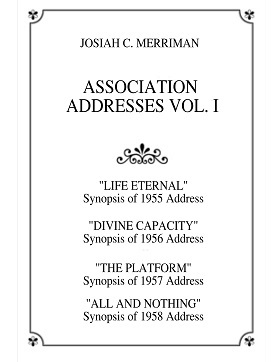 In his 1955 address, Mr. Merriman writes: “CONVERSATION is a very important subject. All thinking is conversation, either silent or audible. Keep your conversation in heaven. . .. Your thinking is your experience. That which you are experiencing could be none other than your thinking. Everything you see, everything you hear, everything you feel, or do, is always a mode, or manner, of consciousness. The only reality it has is the sense you have of it. This is your awareness. (See Unity of Good 8:5-8). “How much longer are you going to clothe your thinking with material wrappings? How long are you going to embody your thinking with thoughts of delay, tomorrow, limitation, maybe, and so forth? “All your troubles come from thinking habitually from the human viewpoint instead of from inspiration. Watch your habit of speech and conversation. They are your habits of thinking. In Proverbs it says, “For as he thinketh in his heart, so is he.” (Prov. 23:7). Your word choice determines the kind of thinking you are doing. What words are you using? You cannot afford to be careless with your words.